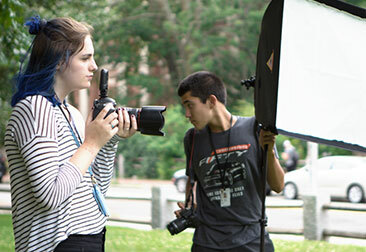 The 12-Weekend Photography Camp for teens offers aspiring visual artists the opportunity to explore digital photography under the guidance of working industry professionals. 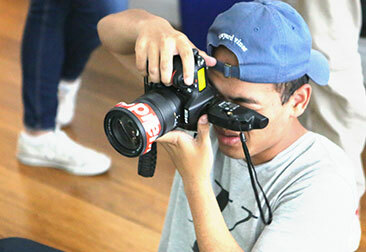 Over the course of 12 consecutive Saturdays during the school year, our teen photography campers learn to research, compose, capture, and refine digital photographic projects, through hands-on instruction and experience. Students are encouraged to be creative and to think of each project as a concise statement of artistic, documentary, journalistic, or commercial intent. During their weekend classes, students learn professional techniques in practical labs, go on field trips to photograph a variety of locations and subjects, and use industry-standard digital imaging software. Our photography classes for teens include lectures and demonstrations from professional photographers to enrich campers’ experience of working, professional-grade studios. Weekend photography campers explore a full repertoire of light and shadow techniques with professional lighting, grip hardware, strobe lighting, and unconventional practical sources of light and shadow. Throughout the course of the 12-weekend camp, students will present their work in class and create a body of photographs of which they can be proud. Campers explore a full repertoire of light and shadow techniques with professional lighting, grip hardware, strobe lighting, and unconventional practical sources of light and shadow. Classes include lectures and demonstrations from professional photographers to enrich campers’ experience of working professional-grade studios. Students will present their work in class, creating a body of photographs of which they can be proud. All 12-Weekend Photography Camp teen students at our New York City campus are required to bring with them to the camp a digital camera with manual exposure control. Click here to learn about the application process. Tuition includes all cost for instruction and use of equipment and software. Tuition does not include transportation, room and board, and personal expenses. Please note that curriculum, dates, prices are open to change.